To celebrate Vista’s 15th anniversary, we are bringing you a spotlight of someone who started his or her employment with Vista across each of the 15 years. To know Kenny Kinter is to love him. A dedicated father of four with another one on the way, he has been a valued member of The Vista School family as a as both a Behavior Technician and Educational Behavior Support since the day he started on September 28, 2009. Bursting with personality and an engaging sense of humor, he helps to bring a smile to his teammates’ faces, even after some physically and mentally exhausting days together. Kenny recently collaborated to transfer two high school students to Vista’s Community Integration Center, an adult training facility. During the transfer, he got to know the life skills Instructors and adult employment services team, a process he enjoyed. Watching his own young sons and daughter at home achieve significant development milestones keeps the perspective and reality of what many Vista families experience in their own homes fresh for Kenny. 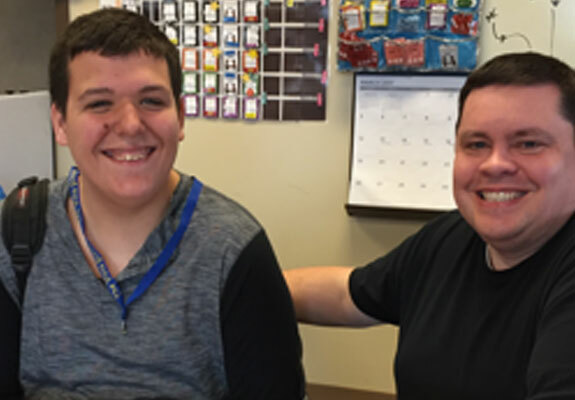 Pictured: Kenny Kinter, right, and high school student NF.